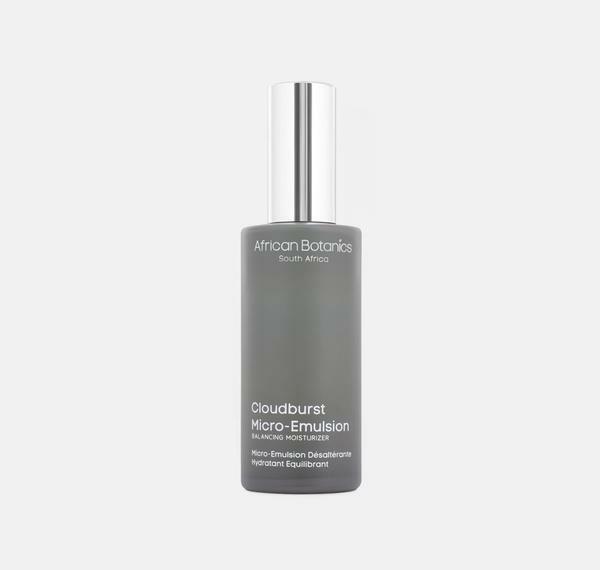 African Botanics Cloudburst Micro-Emulsion Balancing Lotion (Review Forthcoming) is the next generation of anti-aging, moisture-replenishing, hybrid moisturizers. Featuring a fast acting micro-fine and opulent formula that is powered by advanced anti-wrinkle skincare technologies, fruit enzymes, minerals, uniquely extracted botanical humectants and a high concentration of antioxidants to help balance, detoxify, firm, plump, improve skin health and retain moisture levels in the dermis while always enabling it to breathe. • Improves skin’s radiance and reinforces the cell detoxification process with Candida Saitoana Extract while increasing firmness and elasticity with Kigelia Africana. • Plumps with Copper, Plant Peptides and deeply penetrates skin for intense and continuous moisture with Sodium Hyaluronate molecules. • Prevents damage caused by free radicals and protects against premature aging while encouraging collagen synthesis with Vitamin C, Vitamin E, Niacinamide, Resveratrol and antioxidant-rich Green Coffee. • Regulates sebum production, prevents breakouts and skin oxidation with Copper, Magnesium and Zinc while oxygenating cells. • Brightens, detoxifies and illuminates the skin with tropical fruit enzymes reducing the appearance of age spots and uneven skin tone. • Promotes circulation, soothes and reduces redness and irritations with anti-inflammatory botanical extracts derived from African Immortelle, Resurrection Plant, Green Rooibos Tea, Rosa Centifolia, Yarrow and Cape Chamomile. This radiance-boosting formula incorporates molecular science, powerful antioxidants and resilient wild-crafted botanicals which address the first signs of aging, skin dehydration, dullness, sagging, stress and fatigue. Employing the ancient botanical knowledge of Southern African tribes, we harnessed and captured the potent synergy of anti-aging, anti-inflammatory and adaptogenic properties of African Bush and Desert plants that help regenerate and replenish the skin. Rich in Polyphenols, Omegas 3, 6, 7 & 9, Plant Ceramides, Lipids and Amino Acids that help reinforce skin’s natural restorative abilities. Contains the latest in Marine glycobiology derived from very resilient Laminaria Algae. * Rich in biologically active oligosacharides, these truly unique molecules significantly reduce the depth of wrinkles while protecting and repairing skin cells. *The unique ability of Laminaria Algae molecules is to protect and repair cells. Living in the Iroise Sea, this Algae have developed a defense system enabling it to resist the extreme conditions such as storms, ocean currents and very high tides. The fucoidan structure in the cell walls of the Laminaria plays a protective and restorative role in rebuilding the tissues after a storm. In-Vitro testing demonstrated that Laminaria Algae stimulates Type 1 Collagen synthesis and fibroblast proliferation. The fucoidans blocking the enzymes responsible for the deterioration of the extracellular matrix as well as the pro-inflammatory cytokines which damage the collagen. Ideal for all skin types including those that are exposed to urban pollution, humidity, harsh/dry climates and is recommended for dull, oily, unbalanced, acne-prone, congested, blemished and sensitive skin with inflammatory flare ups. Ingredients: Aqua, Glycerin, Sodium Hyaluronate, Niacinamide (Vitamin B3), Hydrolyzed Rice Protein (Di- and tripeptides), Yeast Extract, Hydrolyzed F- Fucoidan (Algae) Extract, Myrothamus Flabellifolius (Resurrection)** Plant, Hydrolyzed Candida Saitoana Extract, Kigelia Africana Fruit Extract**, Panicum Miliaceum (Millet) Seed Extract, Tannic Acid, Potassium Sorbate, Carbomer, Panthenol (Vitamin B5), Tetrahexyldecyl Ascorbate (Vitamin C), Hamamelis Virginia (Witch Hazel), Aspalathus Linearis (Green Rooibos)* Tea, D-alpha Tocopherol (Vitamin E), Centella Asiatica (Gotu Kola), * Zinc Gluconate, Copper Gluconate, Sclerocarya Birrea (Marula)** Seed Oil, Resveratrol Ferment Extract, Tetrasodium Glutamate Diacetate, Ginko Biloba Extract, Magnesium Sulfate, Green Coffee, Caffein, Allantoin, Carica (Papaya) Extract, Ananas Sativus (Pineapple) Fruit Extract, Eriocephalus Punctulatus (Cape Chamomile)**, Schinziophyton Rautanenii (Mongongo)** Seed Oil, Adansonia Digitata (Baobab)** Seed Oil, Citrillus Lanatus (Kalahari melon)** Seed Oil, Helichrysum Angustifolium (Everlasting/Immortelle)* Oil, Rosa Centifolia (Rose) Flower Oil, Ascorbyl Palmitate (Vit C), Archillea Millefolium (Yarrow)*, Aloe Ferox* Leaf Extract, Aminomethyl Propanol, Ethylhexylglycerin, Phenoxyethanol. *Organic, **Wild-Harvested Ingredients. Contains responsibly sourced and Fair Trade ingredients. Never tested on animals.Formulated without silicones, mineral oils, parabens, allergens, phthalates, synthetic fragrances, PEGs and SLSs. Directions: Apply daily to face, neck and décolletage after Rose Treatment Essence and/or any treatment serum. Add additional layers to plump and prime the skin for makeup. This is truly a luxury line. It is the best of the best, no question! I do need something brightening... my skin has looked very dull lately. This is phenomenal, and so worth trying, Brooke!